$950 framed / shipped unframed for the same price. This constellation has long had a strong female connection. In Persia, she was drawn by the astronomer al-Sufi as a queen wearing a crown and holding a staff with a crescent moon in her right hand. In Greece, she was Cassiopeia, the queen of whose vain declaration of beauty nearly killed her daughter, Andromeda, and sent her spinning around the north pole for eternity after her daughter was rescued by Perseus. In some Arab atlases, these same five stars layed out in a w-shape were seen as figure called the "Tinted Hand" which was said to represent a woman's hand dyed red with henna or the bloodied hand of Muhammed's daughter Fatima. In the 1600s, she was seen as Bathseba, Deborah or Mary Magdelene. In early Chinese astrology the stars were seen as a fan. 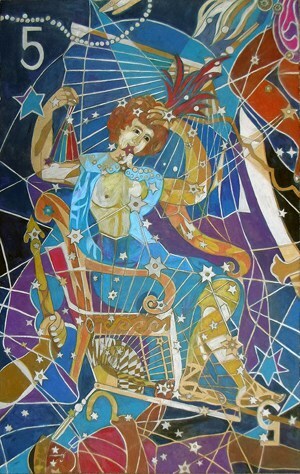 In my depiction you can see the fan in the background as well as holding one in the background, like an aging theater star trying to hold on to her beauty while surrounded by threats on all sides—as suggested by the many constellations around the edges from traditional Greek-myth-derived star maps. Click to purchase original, prints or other products. 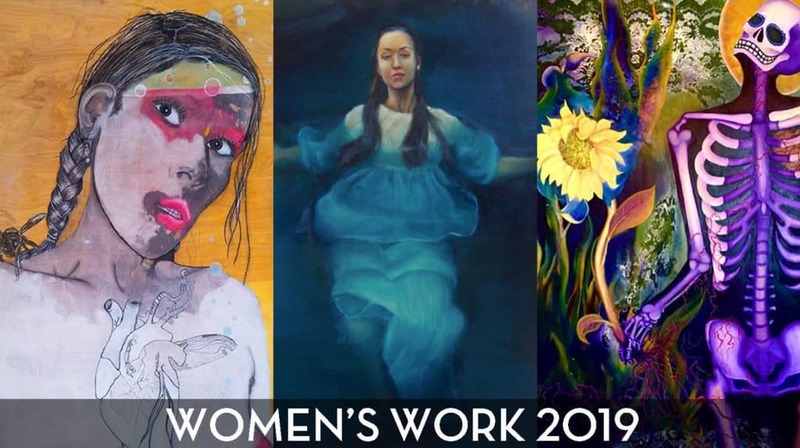 Ghostwolf Gallery celebrates National Women’s History Month with it’s annual Women’s Work juried exhibition. Now in it’s third year, this eclectic exhibition explores female identity: past, present, and future, through the works of local women artists. Join us in celebrating their vision with an evening of fun, food, and art! Women’s Work will show the entire month of March in our west gallery. 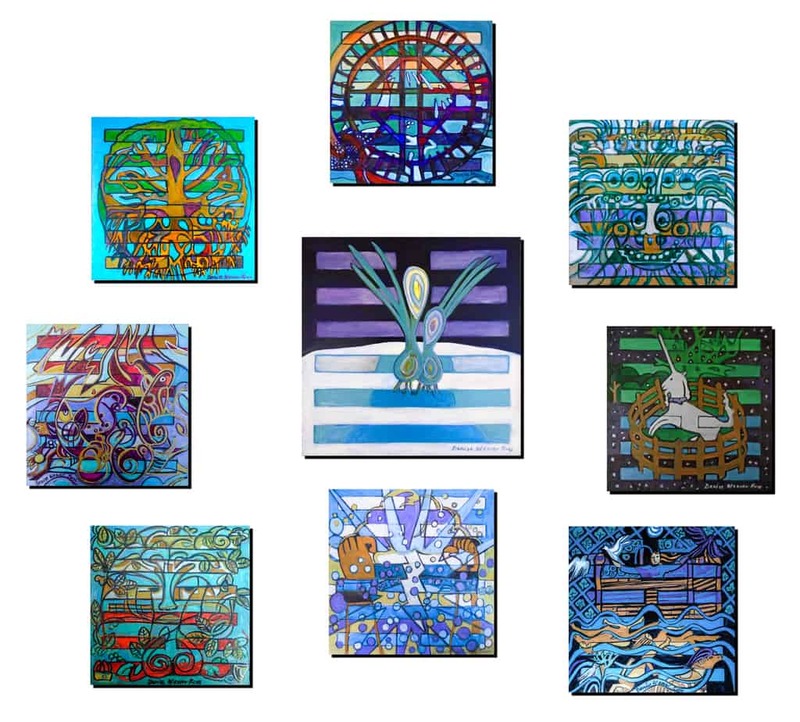 This year’s artists include: Audrey Montoya, Brooke Beggio, Contessa L Lowery, Elizabeth Criger, Elizabeth MacQuigg, Jennifer DeSantis, Jessi Lloyd, Karen Hymer, L. BaLoMbini, Lisbeth Cort, Marian Berg, NC Magnusson, Sarah Lovell, Sarah Stearman, Sonia Luévano, Susan Joseph, Venae Warner, Virginia Heiden, Zienna Brunsted Stewart, and Sandi J Ludescher. 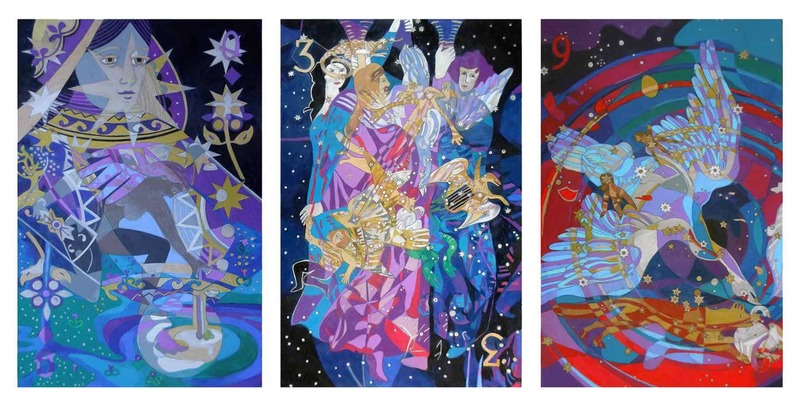 Also available on First Firday and beyond at Ghostwolf will be these brilliantly colored durable, ready-to-hang, 12x18-inch metal prints from the Star Suit for $175 each. 901 Edith SE, Albuquerque, New Mexico 87102 • Open for events and by appointment. MUGS is open Thursday-Saturday from 8am-Noon.